The additive/subtractive process of developing plastic form is the most difficult for artists to master. There is no clear-cut methodology beyond the proscript of working from general to specific. That is, one blocks-in the primary light/dark pattern before proceeding on the long journey of pushing and pulling the forms to render a cohesive image. My experience as both an artist and teacher has taught me that the best way for one to learn the process of rendering tone is simply by watching how it is done. Unlike learning and applying the lessons of striking an arabesque and verifying proportions there is no definitive measurement to determine if one's form is reading true. The biggest problem I see in many artists’ work once they have achieved their basic portrait and figure drawing skills is a lack of tonal resolution vis-a-vis the inability to achieve the full stretch of values and the fear of pushing a work too far thus collapsing the tones. 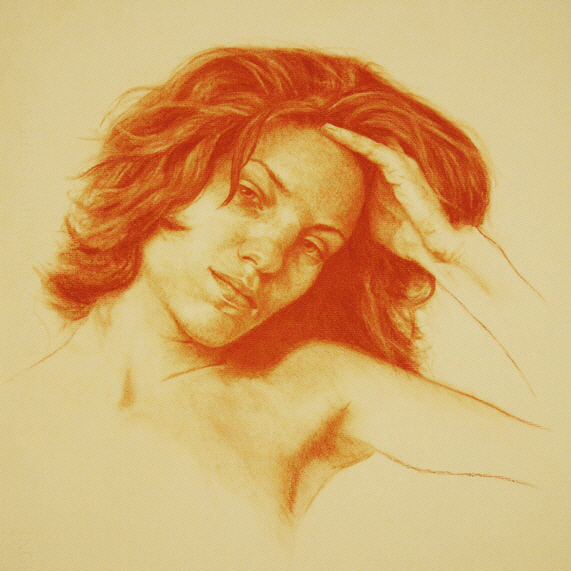 This 4-hour workshop for intermediate to advanced artists will take you beyond the foundation skills learned in Mastering Portrait Drawing 1 & 2 and demonstrate the use of classical conte from start to full tonal resolution. The Practice of Tone is a four-hour instant download program that demonstrates the entire process of rendering form. Working within the facial arena I begin by quickly sketching in the features, followed by blocking-in the primary light/dark pattern before embarking on the long process of applying sanguine conte, stumping it in and then delicately lifting it with painterly strokes of a kneaded eraser. Unlike a class-room, where it is highly unlikely that you would be presented with such an in-depth demonstration due to course time constraints, you will have the 'artist's view' of the drawing as it progresses from beginning to finish. For this program I asked the model to assume a scowling expression. My reasoning was that, one, it would be fun but more importantly you should have a command of a range of expressions. An artist who draws only happy, smiling people has a very limited and narrow repertoire. 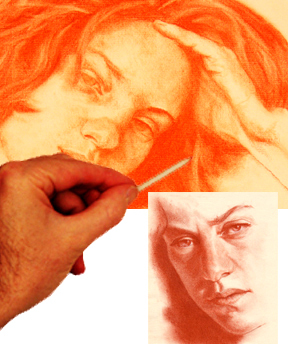 The Practice of Tone for Portrait Artists 4-hour instant download workshop is ONLY $57.00!